420 children died of malnutrition across Fiji in 2013. Now the Fiji Times reveals that the Health Ministry has confirmed that the 1,422 lab confirmed cases are the highest ever on record with one suspected death since October 30, 2013. Island business reported that the Health Ministry’s communications officer Evelyn Mani confirmed that in only 6 days, between 1 January 2014 and 6 January 2014, a total of 195 cases were recorded - 28 in the West and 167 in the central division. 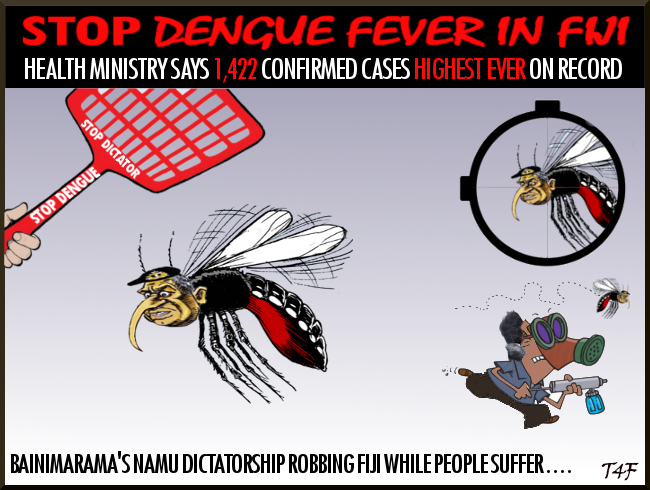 In addition to the end of December figures of 283, the total number of people diagnosed with dengue fever since the start of November 2013 was 478. The ministry's national communicable diseases adviser, Dr Mike Kama, said the cases continue to rise - it hasn't let off any bit from when he had last provided an update. We here in Fiji haven't seen it to be so high. That's why the concern is there, said Kama. Innocent children and people are dying under Bainimarama's corrupt dictatorship. This is the reality of the "better Fiji" that Bainimarama is delivering to Fiji. Another lie by Bainimarama. Under Bainimarama parents struggle to make ends meet with Fiji suffering from its highest levels of unemployment, a poor economy, dying industries, a ballooning national debt that Fiji cant afford, land theft, censorship, false promises, murder, torture, massive levels of corruption and no rule of law. Meanwhile, the namu (mosquito in Fijian) Bainimarama, and his family and friends, get richer through corrupt practices - paying himself multiple salaries, taking free trips, embezzling taxpayer funds, stealing native lands for family and friends, wining and dining at expensive resorts, restaurants and hotels all on the taxpayer's account. This is corruption and one of the things that Bainimarama accused the Qarase government of doing. But Bainimarama is actually doing it himself, and on a massive scale, becoming the most corrupt person in Fiji's entire history. Yes, dengue fever, malnutrition and other evils need to be eradicated from Fiji but so too does the Bainimarama dictatorship with all its lies, corruption and no rule of law that is hurting you and your children.